It’s been six months since Elon Musk announced the new Tesla HW2 models with what he proclaimed would be the world’s first fully autonomous, self-driving automobiles. And, guess what? Tesla is not perceptibly closer to a fully autonomous car today than they were six months ago. In fact, the last six months have been consumed playing catchup to the first generation Tesla with its Mobileye technology which Tesla quietly dropped while Intel spent $15.3 billion last month acquiring the company and its technology. In ditching Mobileye, Tesla basically threw the baby out with the bath water leaving them with fancy new autopilot hardware and no code. To make matters worse, their top two guys in the autonomous driving division abruptly left the company. And then along comes the Cadillac Easter Bunny last week to announce the fall availability of Super Cruise, a fully self-driving automobile for 160,000 miles of U.S. interstate highways. Having just returned from an 1,100 mile Interstate journey through Florida in our four-month-old Tesla, I thought it might be helpful to document the progress that has been made toward realizing Elon’s "I Have a Dream" speech from last October in which he, too, promised a hands-free coast-to-coast drive in a Tesla by the end of 2017. Spoiler Alert: Don’t be misled by our license plate. It’s not gonna happen this year! If you’ve been following along in our Autonomous Car series of articles, you already know that there have been some hiccups in the Tesla saga. But there’s some good news today. Our Florida trip confirmed that Tesla vehicles with AutoPilot 2 technology are close to achieving parity with the first generation Tesla automobiles. That’s not to suggest that you would ever want to take your hands off the steering wheel unless you have a death wish. There were at least a half dozen incidents where your wish would have been realized during our trip. What is particularly disturbing is that Tesla apparently has made a conscious design decision to automatically turn off AP2 whenever it encounters a situation it can’t handle. One can only assume this has been done to afford the company deniability when you and your passengers are lying face down in a ditch somewhere because AP2 did something stupid while your car was barreling down the road at 70+ miles per hour. Your Tesla’s log would show that AP2 was not engaged at the moment of your untimely demise. Never mind that it might have caused it and then turned itself off. But keep in mind that Tesla has warned you not to take your hands off the wheel, and that’s what they’ll tell the jury. In the meantime, Cadillac will actually be deploying hands-free cars to its customers. By design, AP2 is not a system that gives you even a second’s warning that your autonomous vehicle is about to come unglued. In fact, you get no warning other than a beep signifying that AP2 is no longer functioning. Meanwhile, cruise control takes over and keeps your Tesla zipping along at your previous AP2 speed regardless of the direction in which your Tesla may be headed. Tesla AP2 also has an uncanny ability to abruptly veer left whenever AP2 fails. Your only salvation is two hands firmly locking down the steering wheel to assure that the car can’t dart into another lane of traffic, a retaining wall, or a ditch on the side of the road. While we’d give the Tesla a solid A on 99% of our 1,100 mile adventure, that wouldn’t have been good enough to keep you out of the hospital or mortuary if you had elected to make the trip a hands-free adventure. You’ve been warned! As this Google Map of the roadway makes clear, we are not talking about sharp curves in the highway. These are sections of interstate which do not even warrant a curve warning. What’s still missing from the Tesla AP2 self-driving methodology is any reliance upon maps, cameras, radar, or sonar to detect or inhibit collisions with objects, merging vehicles, or vehicles traveling anywhere except directly in front of your vehicle. Watch the video above again and count the tenths of a second that elapsed between the time AP2 disengaged itself while the Tesla veered left until the car immediately beside us passes our Tesla in the left lane. You will note there was no driver alert of any kind that the car was there nor did our Tesla feel shy about veering directly into the other car’s path. 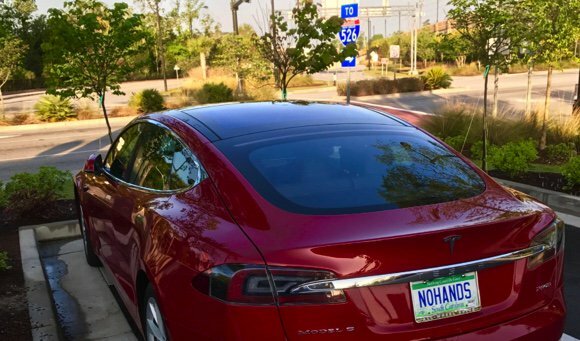 We’ve documented the current state of AP2 development primarily to warn would-be Tesla drivers to be extremely careful. As we’ve noted before, drive a Tesla with AP2 enabled using the same care you would use if holding a toddler in your lap with their hands on your steering wheel. AP2 has roughly the same driving acumen as that toddler. Maybe some day but, absent a miracle and not just a sales pitch, it won’t be this year for Tesla. In the meantime, Tesla is about to become part of a very crowded field. They will have not only Cadillac but also Mercedes, BMW, Audi, and the Japanese cars to contend with not to mention some add-on hardware from Google and perhaps Apple, Delphi, or perhaps a $999 add-on from George Hotz that will work with current generation vehicles. One thing’s for sure. It’s going to be exciting! There is a silver lining to our Tesla story. We made the whole 1,100 mile journey at the same pace as any other automobile without spending a nickel on fuel of any kind. That in itself is quite a feat and a testament to Elon Musk’s EV vision. For those headed down I-95 to Florida in a Tesla, here are a few tips. The hands-down winner for Worst Supercharger goes to the Savannah, Georgia airport. Charging time was about 100 miles in an hour with a single (lousy & overpriced) restaurant inside the airport. You can get your parking pass stamped at the Information Desk in the terminal to get out of the airport for free. 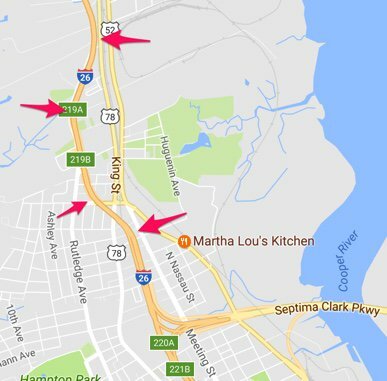 Don’t miss the Supercharger in Kingsland, Georgia and Malson’s BBQ. And no Supercharger can top the Port Orange, Florida specs of 300 miles in under an hour while dining at any of more than a dozen terrific restaurants. Positioned next to the Tesla superchargers in Port Orange was an RV exhibition with dozens of Class A (6-9 MPG) motorhomes including $400,000+ Winnebagos from LaMesaRV. And look whose Collision Avoidance System Winnebago is using. 🙂 Thanks, Philip Mascioli, for the great tour.